One of my hobbies is 3D modeling with computers. 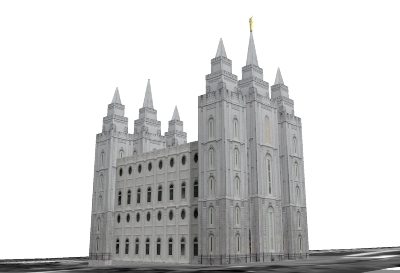 A couple years ago, when Google acquired Keyhole and the Google Earth and Sketchup software, I chose to build the Salt Lake Temple in 3D for it, as a tribute to my love of temples and so all the world can see this unique temple’s architecture and majesty in Google Earth. It took me a few days, and many hours of Photoshoping photographs of the Salt Lake Temple to get the textures just right and the structure built to scale. But I think it was a worthwhile experience and will give many people the opportunity to “virtually” visit the Salt Lake Temple on Temple Square. When I was done I submitted my model to Google’s 3D Warehouse so that anyone in the world could download and see the temple in Google Earth. Just recently I noticed that my model has been given Google’s distinction of being one of the “Best in 3D Warehouse” and will show up in that layer of Google Earth if you have it. You can view the model, download it into Google Earth, see rankings/reviews, descriptions, location, and other details at this link. I guess you could say that I am continuing the tradition of my predecessors in a small way, since one of my ancestors was William Warner Player, the chief stone mason on the original Nauvoo Temple. I have built other temples in 3D also, which I will share on another day. Very nice work! Context is so valuable in all things, and Google earth is helping to provide a digital context to where we live, work, and play each day by providing a repository for the built environment. This is an invaluable tool to help us move forward and improve the cities we live in. Thanks! Google Earth is definitely providing a new viewpoint from which to understand the world around us.